Star Trek Beyond is a 2016 American science fiction action adventure film directed by Justin Lin from a screenplay by Simon Pegg and Doug Jung, based on the series Star Trek, created by Gene Roddenberry. It is the thirteenth film in the Star Trek film franchise and the third installment in the reboot series, following Star Trek and Star Trek Into Darkness . Chris Pine and Zachary Quinto reprise their roles as Captain James T. Kirk and Commander Spock, with Pegg, Karl Urban, Zoe Saldana, John Cho, and Anton Yelchin reprising their roles from the previous films. Idris Elba and Sofia Boutella also join the cast. Star Trek Beyond is a 2016 American science fiction action adventure film directed by Justin Lin from a screenplay by Simon Pegg and Doug Jung, based on the series Star Trek, created by Gene Roddenberry. It is the thirteenth film in the Star Trek film franchise and the third installment in the reboot series, following Star Trek (2009) and Star Trek Into Darkness (2013). Chris Pine and Zachary Quinto reprise their roles as Captain James T. Kirk and Commander Spock, with Pegg, Karl Urban, Zoe Saldana, John Cho, and Anton Yelchin reprising their roles from the previous films. Idris Elba and Sofia Boutella also join the cast. Principal photography began in Vancouver on June 25, 2015. The film premiered in Sydney on July 7, 2016 and was released in the United States on July 22, 2016. The film is dedicated to the memory of Yelchin, who died a month prior to the film's release, as well as fellow Star Trek actor Leonard Nimoy, who died during pre-production. 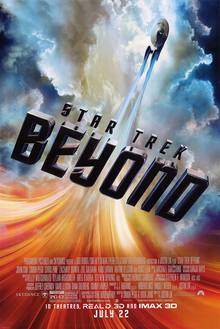 The film received positive reviews, with many critics praising the performances, action scenes, musical score, visual effects, and tributes to Yelchin and Nimoy. In this scene we see the Enterprise leaving space dock then attacked shortly after. All credit goes to Paramount Pictures. Part 1 of the opening scene to Star Trek Beyond. All credit goes to Paramount Pictures.